In Beijing, Parliament Speaker Ali Larijani has said America’s hostile unilateral policies, including the imposition of sanctions and trade tariffs on other countries, will fail to harm world nations, including Iran and China. 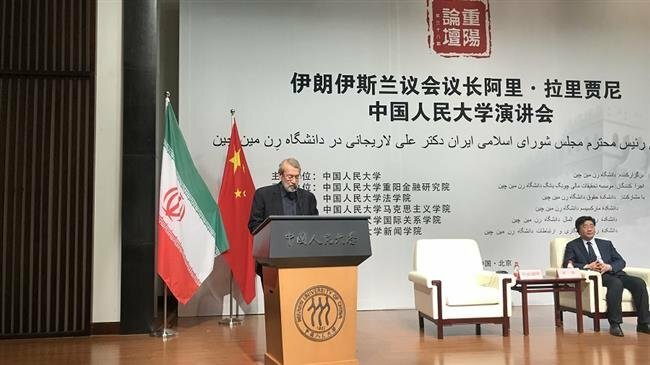 Addressing students and professors at Renmin University of China in Beijing on Tuesday, Larijani said that unbridled unilateralism is not acceptable to world nations, paticularly Iran and China, in the 21st century. The Trump administration withdrew from the 2015 Iran nuclear deal – to which China is also a signatory – last May and unleashed and the “toughest ever” sanctions against Tehran. China – along with other parties to the deal — has repeatedly defended the nuclear deal and expressed its resolve to keep the accord in place. “Although the parties to the JCPOA have turned down the illegitimate US request [to leave the deal] and tried to save it, we expect them to protect the agreement, honor multilateralism, completely meet their commitments and not to succumb to force,” he said. The top Iranian parliamentarian also condemned the US for providing support to international terrorists and extremists in an attempt to topple independent governments and bring, instead, illegitimate regimes to power. “Such US meddling in other countries’ domestic affairs constitutes a serious danger,” he warned. Larijnai further described Washington as the main supporter of terrorist groups, which have, for years, been sowing chaos in Afghanistan, Iraq, Syria and elsewhere. “Since the onset, the Islamic Republic has responsibly backed political solutions to the conflicts in those countries,” added the top Iranian parliamentarian. Larijani further blasted the Israeli regime for its adventurism and attempts to fuel chaos in the Middle East with the aim of keeping Palestine under occupation. On Wednesday, Larijani held talks with Lee Shoe Young, chairman of Iran-China parliamentary friendship group. “No country can damage the Iran-China relations,” he added.